Each club needed to progress through the group stage and knockout rounds to reach the final, playing 12 matches in total. Liverpool finished second in their group behind 2004 runners-up AS Monaco and subsequently beat Bayer Leverkusen, Juventus and Chelsea to progress to the final. Milan won their group ahead of Barcelona and faced Manchester United, Internazionale and PSV Eindhoven before reaching the final. Milan were regarded as favourites before the match and took the lead within the first minute through captain Paolo Maldini. Milan striker Hernán Crespo added two more goals before half-time to make it 3–0. In the second half Liverpool launched a comeback and scored three goals in a dramatic six-minute spell to level the scores at 3–3, with goals from Steven Gerrard, Vladimír Šmicer and Xabi Alonso. The scores remained the same during extra time, and a penalty shoot-out was required to decide the champions. The score was 3–2 to Liverpool when Andriy Shevchenko's penalty was saved by Liverpool goalkeeper Jerzy Dudek. Thus Liverpool won their fifth European Cup, were awarded the trophy permanently, and claimed a multiple-winner badge. Liverpool's comeback gave rise to the final being known as the Miracle of Istanbul, and is regarded as one of the greatest finals in the history of the tournament. Teams qualified for the Champions League group stage, either directly or through three preliminary rounds, based on both their position in the preceding domestic league and the strength of that league. Each club needed to progress through the group stage and knockout rounds to reach the final, playing 12 matches in total. Liverpool finished second in their group behind 2004 Champions League runners-up AS Monaco and subsequently beat Bayer Leverkusen, Juventus and Chelsea to progress to the final. Milan won their group ahead of Barcelona and faced Manchester United, Internazionale and PSV Eindhoven before reaching the final. Liverpool entered the competition in the third qualifying round after finishing fourth in the 2003–04 FA Premier League. They faced Austrian side Grazer AK and won the first leg 2–0 at Graz after two goals from captain Steven Gerrard. They lost the second leg 1–0 at Anfield but progressed to the group stage by virtue of winning the tie 2–1 on aggregate. Milan entered the competition in the group stage after winning Serie A. The group stages were contested as eight double round-robin groups of four teams, the top two qualifying for the knockout stages. Knockout ties were decided based on home and away matches. The 2005 final was the sixth time Liverpool had reached the final and it was their first appearance since the 1985 European Cup Final, when they lost 1–0 to Juventus and were subsequently banned from European competition for an indefinite period due to the Heysel Stadium disaster. They had previously won the European Cup on four occasions in 1977, 1978, 1981 and 1984. The match was Milan's tenth appearance in the final. They had won on six occasions (1963, 1969, 1989, 1990, 1994, 2003), and lost three times (1958, 1993, 1995). In total the teams had participated in 14 finals between them. Prior to the game, Milan were assured of entering the Champions League the following season after finishing second in Serie A. Liverpool meanwhile had failed to finish in the top four in the Premier League, and had to win the final to enter the competition the following season. Even if they did win the match, they were not assured of a place after UEFA failed to confirm whether they would allow Liverpool to defend the championship. The Football Association supported Liverpool, stating, "We have already submitted a written request to have an additional place, should they win the Champions League". Milan manager Carlo Ancelotti said "I think a team that wins should have the right to defend it but we may just do the English federation a favour and solve this." Each team was allocated 20,000 tickets for the final, out of a total of 69,000. 14,400 tickets were made available to the general public, with half of those allocated through a ballot on UEFA's website, and the other half reserved for Turkish fans by the Turkish Football Federation. The final 14,600 tickets were distributed to UEFA's "football family", consisting of UEFA officials, national football associations, commercial partners and broadcasters. Hotel rooms in the city were scarce, with the 100,000 available quickly booked by travel agents and fans. 30,000 Liverpool fans made the trip to Istanbul, but only 20,000 were expected to have tickets. The BBC reported early arrivals were lively but there was no violence and the mood between the two fans was friendly. Milan were regarded as favourites and their team included many players who had experienced success in the competition. The most notable was captain Paolo Maldini, who had won the competition four times previously, all with Milan, and Clarence Seedorf who had won the competition three times with three clubs. Liverpool had been considered underdogs throughout the competition, but had beaten more favoured opposition, including Juventus and Chelsea, to reach the final. Liverpool manager Rafael Benítez acknowledged this: "Maybe Milan are favourites, but we have confidence, and we can win". Arsenal manager Arsène Wenger felt Liverpool would win the match: "I fancy Liverpool as Milan look jaded physically and certainly mentally, by losing the [Serie A] title, I think they have never had a better chance than now to beat Milan." Liverpool defender Jamie Carragher was not so optimistic, stating that the Liverpool side were not as good as the one that had won the 2001 UEFA Cup Final: "No disrespect to the squad we have got now but it is obvious we are not as strong as we were when we won the UEFA Cup in 2001. Back then we had a settled team and that season when we went into games against Barcelona and Roma, we always felt we were as good as them." Milan were expected to field a 4–4–2 formation, and there was much speculation about who would partner Andriy Shevchenko in attack. Filippo Inzaghi and Jon Dahl Tomasson were touted, but it was expected that on-loan striker Hernán Crespo would be chosen. This was echoed by Milan manager Ancelotti: "I will not say if he will play from the start, but he will definitely play." Liverpool were also expected to adopt a 4–4–2 formation. Dietmar Hamann was expected to start ahead of Igor Bišćan, and when questioned over whether Djibril Cissé or Milan Baroš would start as main striker, Benítez replied, "Both are good enough, maybe both can play, why not?" The referee for the final was Manuel Mejuto González, who led an all-Spanish crew of officials. His assistant referees were Oscar Martínez Samaniego and Clemente Ayete Plou, and the fourth official was Arturo Daudén Ibáñez. Mejuto González was only the third Spanish referee to officiate a European Cup final, following Manuel Díaz Vega in 1996 and José María Ortiz de Mendíbil in 1969. Liverpool fielded a 4–4–1–1 formation, with the surprise inclusion in the squad being Harry Kewell, who played just behind Milan Baroš, who himself had been picked ahead of Djibril Cissé. The inclusion of Kewell meant Dietmar Hamann was left on the substitutes' bench and Xabi Alonso and Steven Gerrard started in the centre of midfield. Milan fielded a 4–4–2 diamond formation, with Hernán Crespo preferred to Jon Dahl Tomasson and Filippo Inzaghi, who was not included in the match day squad. Liverpool lined up in their red home kit, whilst Milan wore a changed strip of all white. Liverpool won the toss and kicked off. The European Cup didn't fancy Paolo. She wanted Steven, but it took a series of remarkable chat-up lines from the Liverpool manager to ensure his skipper got his wicked way. The only reason Liverpool weren't fatally wounded by a first half blitz is the fortunate fact immortals can't be destroyed. 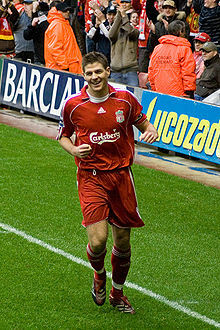 At the start of the second half, Liverpool made a substitution with Dietmar Hamann replacing Steve Finnan and also changed to a 3–5–2 formation to reduce the deficit, with Riise and Šmicer on the flanks, Alonso and Hamann as holding midfielders and Gerrard playing as an attacking midfielder. Liverpool had the best chance early on with Xabi Alonso sending an effort from 35 yards (32 m) narrowly past Milan's right hand post. Two minutes later, Shevchenko forced a save from Dudek with a strong free kick from just outside the Liverpool box. A minute after this, Liverpool scored through captain Gerrard, who connected with Riise's cross and lofted a header past Dida. Soon afterwards, Liverpool scored again as Šmicer beat Dida with a long-range shot into the bottom left-hand corner to leave Liverpool a goal behind. Three minutes after Šmicer's goal, Liverpool were awarded a penalty, after Gerrard made a run into the Milan box for Baros' lay-off and was brought down by Gennaro Gattuso. Xabi Alonso's penalty was saved, but he scored from the rebound to equalise for Liverpool. Milan and Liverpool had chances to take the lead after this, but Clarence Seedorf and Riise failed to score. Milan almost took the lead in the 70th minute, after Dudek dropped a low cross towards Shevchenko, whose effort was cleared off the line by Traore. Gerrard then had a chance to score but he sent his shot over the crossbar. About ten minutes later García could not control a pass from Gerrard which led to a Milan attack, Crespo played the ball back to Kaka, whose subsequent shot was blocked by Jamie Carragher. A number of substitutions were made before the end of full-time with Liverpool replacing Milan Baroš with Djibril Cissé, while Milan replaced Hernán Crespo and Clarence Seedorf with Jon Dahl Tomasson and Serginho respectively. Milan had the last chance before full-time but Kaka failed to direct Jaap Stam's header towards goal, meaning the final would go to extra time for the 13th time in the competition's history. Liverpool kicked off the first half of extra time. Pirlo had a chance in the early stages, but he put his shot over the crossbar. Tomasson came close in the later stages of the first period of extra time, but he could not make contact with the ball. Vladimír Šmicer required treatment for cramp towards the end of the first period, as a number of Liverpool players felt fatigued. Liverpool had the most of the early exchanges after winning two corners, but could not score. Shortly afterwards, Milan make their final substitution replacing Gennaro Gattuso with Rui Costa. The best chance of the second half came near the end when Shevchenko shot at goal. Dudek saved only for it to rebound back out to Shevchenko, who again shot from under 6 yards (5.5 m), which Dudek again saved by pushing the shot over the bar. Liverpool had one last chance at the end of extra time, but John Arne Riise's free kick shot was blocked and following this the referee signalled the end of extra time, which meant a penalty shoot-out would decide the championship. Liverpool and Milan had each won their last European Cups after winning penalty shoot-outs, and it was also the second time in three years that the final would be decided this way - previously, in the 2003 all-Italian final at Old Trafford, Milan had defeated Juventus 3–2. Milan were first to take a penalty, but Serginho - who had taken Milan's first penalty in 2003 and scored - shot over the crossbar after attempts from Jerzy Dudek to distract him, which mimicked Bruce Grobbelaar's "spaghetti legs" antics during the shootout in the 1984 final against Roma. Dietmar Hamann took Liverpool's first penalty and, despite having a broken toe, he scored to put Liverpool 1–0 up. Andrea Pirlo was next for Milan, and his penalty was saved by Dudek who dived low to his right. Cisse then scored his penalty to put Liverpool 2–0 up. Tomasson scored Milan's next penalty to make the score 2–1 in Liverpool's favour. Riise was next for Liverpool, but his penalty was saved by Dida. Kaká then scored the subsequent penalty to level the scores at 2–2. Vladimír Šmicer took the next Liverpool penalty, and he scored to give them a one-goal advantage. Shevchenko, who had scored the decisive penalty against Juventus' Gianluigi Buffon in 2003, then had to score or Liverpool would win. He hit his penalty straight down the middle of the goal. Dudek went down to his right, but blocked the shot with his left hand. Liverpool thus won the penalty shootout by a score of 3–2. Liverpool's triumph marked their fifth European Cup and the first by an English team since Manchester United had defeated Bayern Munich in the 1999 final in Barcelona. 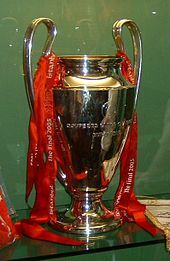 By winning the European Cup for a fifth time, Liverpool earned the privilege of wearing a multiple-winner badge and the right to keep the trophy (under normal competition rules, the winning club can keep the trophy for only 10 months, as they must deliver it to UEFA two months before the next year's final). The 2005–06 participants competed for a new identical trophy. The rule to keep the trophy, which had been in effect since the 1968–69 season, was changed for the 2009–10 season, so that the actual trophy remained with UEFA at all times, thus Liverpool was the fifth and last club to accomplish the feat. Liverpool celebrated their victory by parading the trophy around Liverpool in an open-top double-decker bus the day after the final. They were cheered by approximately 1 million supporters, with an estimated 300,000 fans located around St George's Hall – the final destination of the parade. Business experts estimated that one in five workers took time off following the victory. It was also estimated that Liverpudlians drank around 10,000 bottles of champagne after the match, with supermarket chain Sainsbury's stating: "We've never seen anything like it. We would usually expect to sell this much champagne at Christmas". The European Champion Clubs' Cup trophy won by Liverpool in Istanbul, on display in the club's museum a few weeks after the match. Liverpool manager Rafael Benítez admitted after the match that the manner of his side's victory had stunned him and he stated: "My problem is that I don't have words to express the things that I feel at this moment". Praise for Liverpool also came from outside England, including from Argentine legend Diego Maradona, who said, "Even the Brazil team that won the 1970 World Cup could not have staged a comeback with Milan leading 3–0...The English club proved that miracles really do exist. I've now made Liverpool my English team. They showed that football is the most beautiful sport of all. You knew they could defend, but the team showed they could play too and wrote a page in the history books. The match will last forever. The Liverpool supporters didn't let me go to sleep the night before. There were 10 of them to every three Milan supporters. They showed their unconditional support at half-time when they were losing 3–0 and still they didn't stop singing." Benítez was also prepared to break up his winning side after the final with a number of players expected to leave the club to make way for new arrivals. One of those leaving was Vladimír Šmicer, who had scored Liverpool's second goal in Istanbul, and whose contract was known not to be renewed before the final, meaning he entered knowing the final was his last game for the club. Milan were similarly astonished at the manner in which they had lost the final. Manager Carlo Ancelotti said, "We had six minutes of madness in which we threw away the position we had reached until then". The result compounded Milan's failure to win Serie A a week before the match. Milan's vice-president, Adriano Galliani, played down the loss, asserting: "Even if we come second in the league, and second in the Champions League, this is not a disastrous season for us". Captain Paolo Maldini was less optimistic, stating that the reverse was a "huge disappointment", but he added that Milan would accept the defeat and "go out with their heads high". Much discussion after the final centered on the future of Liverpool captain Steven Gerrard who had been linked with a move to rivals Chelsea. Gerrard stated in the immediate aftermath of the victory, "How can I think of leaving Liverpool after a night like this?" Media reports then quoted Gerrard as saying he wished to leave Liverpool, citing events that had occurred in the month after the Champions League victory as the reason. On 6 July, however, Liverpool chief executive Rick Parry released a statement confirming that Gerrard would remain at the club, and Gerrard signed a new four-year contract on 8 July. Despite winning the competition, Liverpool's place in next season's Champions League was still in doubt. Prior to the 2005 Champions League Final, The Football Association had decided on 5 May that only the top four finishers in the Premier League would qualify and Liverpool ended their domestic season in fifth place behind Everton. UEFA initially maintained that each country could only have four Champions League spots and suggested that the FA could nominate Liverpool instead of Everton. Liverpool faced a three-week wait to discover if they would be allowed to defend their title. UEFA came to a decision on 10 June, confirming that both Everton and Liverpool would be able to compete in the Champions League; however, Liverpool were entered into the first qualifying round, and were given no "country protection"; meaning they could face another English club at any stage of the competition. The UEFA Executive Committee also amended the regulations for future competitions so that the holders would have the right to defend their title and therefore qualify automatically, though at the expense of the lowest placed team in those countries that had more than one qualifier. As champions, Liverpool faced CSKA Moscow (winners of the 2005 UEFA Cup Final) in the 2005 UEFA Super Cup, held on 26 August. Liverpool won the match 3–1 after extra time. 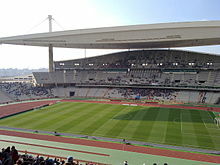 Liverpool's victory in Istanbul also meant they qualified for the 2005 FIFA Club World Championship. Liverpool beat Deportivo Saprissa 3–0 in the semi-final, and played Copa Libertadores champions São Paulo in the final, losing 1–0. Both teams retained a number of players who played in this final for the rematch in the 2007 final in Athens, which Milan won 2-1. Many players who played in this game also played for their clubs’ legends teams, Liverpool Legends and Milan Glorie, in Liverpool’s 2019 Legends Game at Anfield. Gerrard scored in the final minute of play to win the game for Liverpool 3-2 as the match raised an estimated 1 million pounds for the LFC Foundation. ^ a b "UEFA Champions League – Statistics Handbook 2012/13" (PDF). UEFA.com. Union of European Football Associations. p. 141. Retrieved 22 September 2013. ^ a b "Full time report" (PDF). UEFA. 25 May 2008. Retrieved 30 November 2008. ^ Sweetman, Tom (5 June 2015). "Champions League: 10 unforgettable finals". CNN. Retrieved 31 October 2018. ^ "BBC SPORT | Football | Why it was the greatest cup final". news.bbc.co.uk. Retrieved 2017-03-17. ^ "Istanbul setting for final date". UEFA. Retrieved 29 November 2008. ^ "European aristocrats draw pistols". BBC Sport. 23 May 2005. Retrieved 30 November 2008. ^ "Uefa leaves Liverpool 'door open'". BBC Sport. 1 May 2005. Retrieved 29 November 2008. ^ "FA supports Liverpool's Euro case". BBC Sport. 10 May 2008. Retrieved 29 November 2008. ^ "Ancelotti aims to end Euro debate". BBC Sport. 17 May 2005. Retrieved 30 November 2008. ^ "2005 UEFA Champions League Final event launch" (PDF). UEFA.com. Union of European Football Associations. 1 December 2004. Retrieved 17 December 2018. ^ Sanghera, Mandeep (5 May 2005). "Liverpool fans begin final frenzy". BBC Sport. Retrieved 30 November 2008. ^ "Liverpool ready for AC Milan test". BBC Sport. 25 May 2008. Retrieved 30 November 2008. ^ a b c "Ingredients suggest final to savour". UEFA. 25 May 2005. Retrieved 29 November 2008. ^ "Wenger backs Reds for Euro glory". BBC Sport. 23 May 2005. Retrieved 30 November 2008. ^ "Referee appointed for UEFA Champions League final". UEFA.com. Union of European Football Associations. 23 May 2005. Retrieved 17 December 2018. ^ a b c Glendenning, Barry (25 May 2005). "Liverpool 3–3 AC Milan". The Guardian. London. Retrieved 30 November 2008. ^ a b c "Minute by minute". UEFA. 25 May 2005. Retrieved 30 November 2008. ^ a b c "Champions League final clockwatch". BBC Sport. 25 May 2005. Retrieved 30 November 2008. ^ McRae, Donald (5 August 2011). "Dietmar Hamann: 'It's different to World Cup but it's still exciting'". The Guardian. Guardian News and Media. Retrieved 5 July 2012. ^ a b "Tactical Line-ups – Final – Wednesday 25 May 2005" (PDF). UEFA.com. Union of European Football Associations. 25 May 2005. Retrieved 30 November 2008. ^ "Half Time Report" (PDF). UEFA. 25 May 2005. Retrieved 29 November 2008. ^ "Statistics". UEFA. 25 May 2005. Archived from the original on 26 April 2009. Retrieved 30 November 2008. ^ a b "Regulations for the UEFA Champions League 2006–07" (PDF). UEFA. Archived from the original (PDF) on 1 August 2003. Retrieved 10 July 2006. ^ "Regulations of the UEFA Champions League 2009/10, page 7, III Trophies and medals, Article 5, Trophy" (PDF). Uefa.com. Union of European Football Associations. Retrieved 16 August 2009. ^ "Victory tour seen by a million". BBC News. 26 May 2005. Retrieved 30 November 2008. ^ "Benitez stunned by epic comeback". BBC Sport. 26 May 2005. Retrieved 1 December 2008. ^ a b "Ancelotti shattered after defeat". BBC Sport. 25 May 2005. Retrieved 1 December 2008. ^ "Gerrard could stay after Euro win". BBC Sport. 26 May 2005. Retrieved 30 November 2008. ^ "Gerrard in shock Liverpool U-turn". BBC Sport. 6 July 2005. Retrieved 1 December 2008. ^ "The Steven Gerrard saga". BBC Sport. 10 July 2005. Retrieved 30 November 2008. ^ "Liverpool allowed to defend title". UEFA. 10 June 2005. Archived from the original on 21 June 2007. Retrieved 30 November 2008. ^ "Liverpool 3–1 CSKA Moscow (aet)". BBC Sport. 26 August 2005. Retrieved 30 November 2008. ^ "São Paulo 1–0 Liverpool". BBC Sport. 18 December 2005. Retrieved 30 November 2008.